Well I guess ya’ll heard there is a typhoon in China this week. I haven’t gotten the worst of it, since I’m pretty far from the coast. It has been raining for the past two days though. Yesterday was the worst. It was raining just enough to make it feel like a tropical rainforest and was 110% humidity. It was so bad that when I walked to class I couldn’t tell if the moisture on my face was raindrops or sweat. I think it was sweat. Today things have cooled down quite a bit and it actually feels like fall for the first time since I arrived last month. I turned off the AC and just opened the windows to get some fresh air and the sound of rain rustling in the trees. I’m trying to get organized for my school work since today is my day off. I’ve got to get all my grades recorded and such and I’m teaching this afternoon at a nearby campus for my friend Katie who is on bed rest. She somehow managed to crack two of her vertebra about a month ago when she climbed a mountain. Funny enough she made it all the way back to the base before she fell. Anyhow, keep her in your thoughts as she recovers please. My students are studying American weddings this week which has been a ton of fun. I had them do a journal entry entitled “What is Love?” Their answers were so poetic especially the boys (which made the girls swoon). I had them re-enact a wedding, complete with a preacher, flower girl, ring bearer, etc. The bride and her dad walked down the aisle and the ceremony went on from there. I made rings out of gold paper clips and the maid of honor dressed the bride in a tolit paper wedding gown. The flower girl even threw tolit paper flower petals down the aisle (and yes, the kids were very good at picking up all the pieces after class). They also got to watch movie clips from some of my favorite american wedding movies: Made of Honor, My Best Friend’s Wedding, My Big Fat Greek Wedding, The New Girl and Twilight. I wanted so badly to put in the Princess Bride but I knew they wouldn’t get it. The Chinese don’t get American humor. you been eating this week anything unusual? Take care. Everyone should be returning from Africa in the next several days. The rain has finally stopped. Thankfully. I do have screens on the windows but the bug’s dont seem to be too bad. I haven’t seen more than 2-3 mosquetos since I got here a month ago, so i don’t guess they are too bad. I haven’t really eaten anything to weird this week. I did try dragon fruit. It was awesome.. It tasted kind of like a kiwi only white and with more of those tiny seeds. My friend Amy picked them at the fruit market and knew which ones were the ripest. Delicious. I’m a little worried about the group in Africa after everything in Kenya that went down. I hope they have returned safely by now. The typhoon brought some big windy and rainy days in Xiamen City, fortunately it didn´t hit here directly. But the news said it caused 21 death in Canton area. the night before last I was waken up by the sound of wind, and it was like ghost crying outside of the window. omg, so terrible. 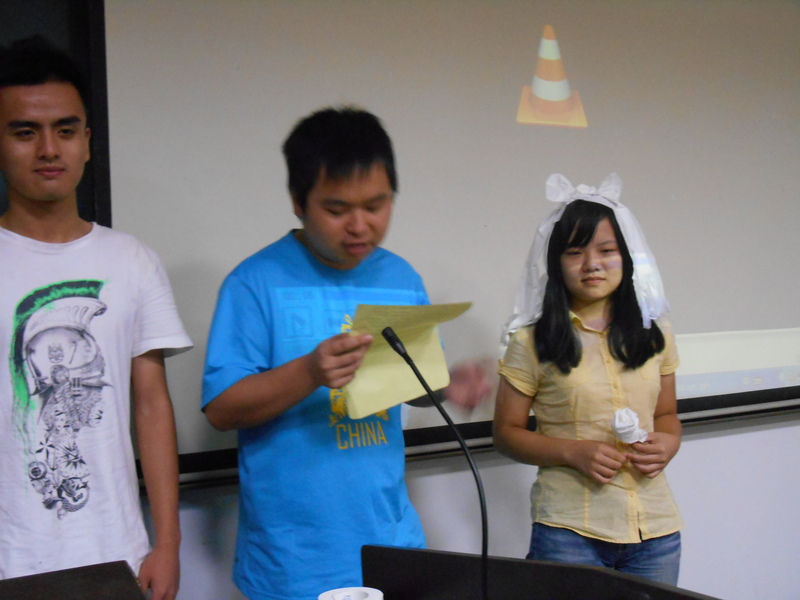 A wedding in the class, hahaha, that is so funny, if my English teacher was as great as you are, my English must be better now, hahaha. The typhoon brought some big windy and rainy days in Xiamen City, fortunately it didn´t hit here directly. But the news said it caused 21 death in Cantonese area. the night before last I was waken up by the sound of wind, and it was like ghost crying outside of the window, so terrible. I don’t know what’s up with the comments you keep posting. For some reason they keep going into my spam folder. I’ll try and get it fixed. The wedding in class was a lot of fun. Benjamin is coming for National holiday, so that should be a lot of fun. I’m supposed to be going with some girls today to get a fish pedicures so I will post and let everyone know how that goes. I can’t believe it is October already. It totally still feels like summer here and the days have not gotten noticably shorter so its hard to picture that fall is coming. Benjamin has also convinced me to write a novel with him for NanoWriMo next month, but we both cheated and started writing our books early. You should totally do it too, if you want to. I really like the wedding veil. The bride looks beautiful!! Sounds like everyone had a good time. You’re an amazing teacher! Toilet Paper… who knew? the girls had fun getting their bride dressed up though. It was a lot of fun. I had to get caught up…have not read your blog since Sept 20th. You are such a great teacher. The kids are learning so much from you and your style of teaching. You are making learning fun; I wish every teacher here in the states were so creative. I really do like teaching. The students are a joy to teach. They listen the first time, and I haven’t had a single behavioral problem so far. My last class on Wednesday got finished early and I told them that I could let them go a few minutes early but we would have to figure out something to do for the next 3-4 minutes. They begged me to sing an American song for them so after a little convincing I sang Amazing Grace. They absolutely loved it.